After leaving a trail of death and destruction in Central America, the storm hit the southern United States -- the third hurricane to hit the region in less than two months as part of an especially active hurricane season. 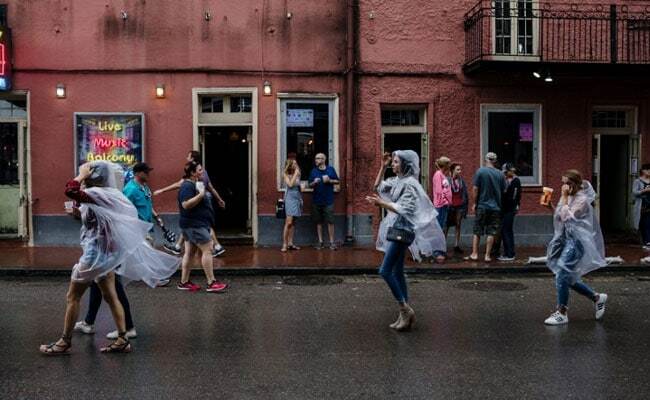 New Orleans: Tropical storm Nate moved quickly inland from the US Gulf Coast early Sunday after making landfall twice as a powerful hurricane, triggering widespread flooding and power outages. More than 100,000 people were without power. Ahead of the storm, officials urged residents to evacuate some vulnerable areas before the storm first made landfall on the southeastern tip of Louisiana on Saturday evening and later hit along the Mississippi coast. At 5:00 am (0900 GMT), the storm had top winds of 70 miles (113 kilometers) per hour and was moving north-northeast at 23 miles per hour, according to the National Hurricane Center. "Rapid weakening anticipated," the NHC said as the storm moved further inland over Mississippi and Alabama. It was expected to track further north through Monday. It has since been downgraded to a tropical storm and hurricane warnings were discontinued. "This is a life-threatening situation. Persons located within these areas should take all necessary actions to protect life and property from rising water and the potential for other dangerous conditions," the NHC said. "The combination of a dangerous storm surge and the tide will cause normally dry areas near the coast to be flooded by rising waters moving inland from the shoreline." Some areas saw storm surge flooding of up to eight feet (2.5 meters). The storm was expected to produce rainfall of up to 10 inches (25.4 centimeters), according to the NHC. In Alabama, Dauphin Island Mayor Jeff Collier said it appeared that most of the local residents had chosen to stay home. "We have had some homes flooded, numerous vehicles, things of that nature... We don't believe we have had any types of injuries from this," he told CNN. "Fortunately, I can say that in the last hour, I think the worst is now behind us." Alabama Governor Kay Ivey tweeted that she had asked President Donald Trump to issue an emergency declaration "to ensure we have all possible resources in place to respond to #HurricaneNate." Trump has released federal aid to help mitigate the storm's impact in Louisiana and Mississippi. New Orleans, which was ravaged in 2005 by Hurricane Katrina, leaving 1,800 people dead in the region, appears to have largely escaped Nate's wrath. The mayor's office lifted a mandatory curfew that had been imposed as a safety measure, saying the hurricane warning for the city was no longer in effect. As the storm approached, multiple shelters were opened for evacuees from low-lying areas, and officials urged residents to stock up on several days' supply of food and water. "I lived through Katrina and I know what that was like," said Jackie Daigre, 69, who was buying groceries in preparation for the hurricane at a busy Walmart store, where the shelves of bottled water were picked almost completely bare. The New Orleans levee system has been considerably fortified since Katrina, but authorities warn that it has not completely eliminated flood risks. Unlike Hurricane Harvey, which dumped record amounts of rain as it hovered over neighboring Texas for a week, fast-moving Nate was expected to pass through quickly along a northerly path. Still, Louisiana Governor John Bel Edwards had warned that Nate could cause unexpected damage. In neighboring Mississippi, lines formed at gas stations before the storm hit. Off the coast, some oil and gas rigs in the Gulf of Mexico were evacuated. New Orleans-area power provider Entergy prepositioned repair crews and warned that outages could last up to a week.